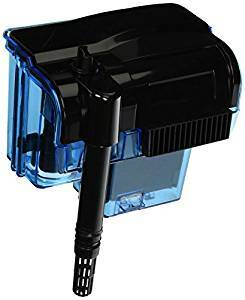 Are you looking for the best aquarium air pump? Come let us educate you on how to choose the right air pump for aquarium. 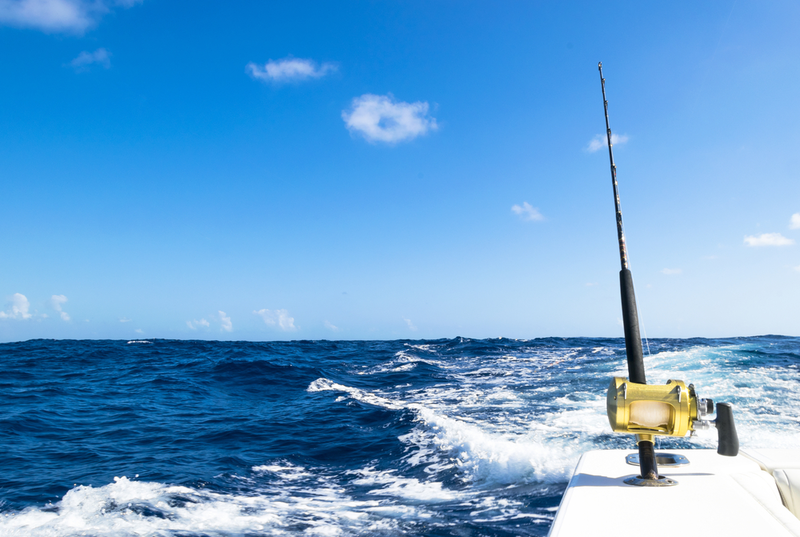 Just like humans need air to carry out metabolic function in the body, so do fishes and other aquatic animals. And although water contains some element of oxygen, there is still a need to supplement the amount available and improve its circulation, and to do that we need air pumps. 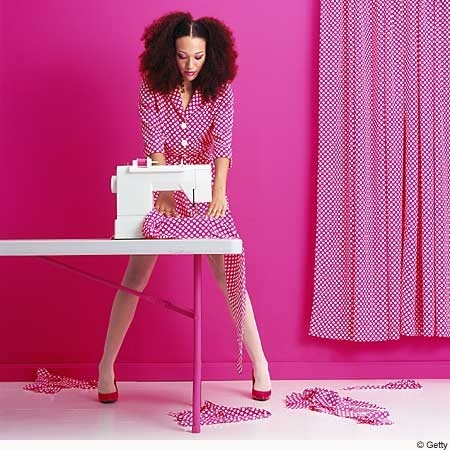 What is an air pump? 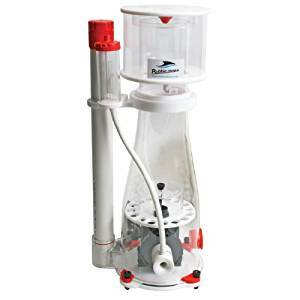 It is a device that basically aerates the water. This it does by mechanically creating air bubbles through pressure. These bubbles find their way to the top of the tank, where they release carbon dioxide and take up oxygen for circulation in the water, down into its depth. Some aquarium filters come with air pumps because they need it to function. However, air pumps are available in the market in different sizes for use in your aquarium. Also, air pumps are electrical devices and are usually attached to tubing, filter, air stones etc. Underwater aquatic animals require oxygen deep in their crevices so that they do not swim to the top in search of it and expose themselves to dangers or to an unaerated environment. Aquariums with ornaments and beautification objects like valves, volcanoes, wheels, air stones etc. do need air to pass through them for them to move and create the desired illusion. Some filters require the presence of air pumps to function. Examples are under gravel and sponge filters. Also, some brands of protein skimmers also need air pump to enable the creation of foams and bubbles. Air bubbles created by air pumps produce current that keeps the water alive and not stagnated. Size of your aquarium: Large and deep aquariums require bigger air pump to handle oxygen circulation around the tank. Size and quantity of air stones: Air stones are loved for the tiny air bubbles and air mist they create, they are also available in different shapes and sizes. So, the bigger and more the air stones, the bigger the air pump needed to power. 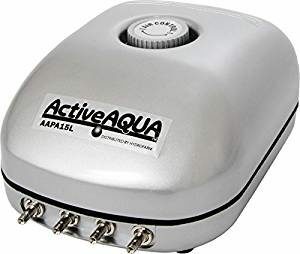 Amount of aquatic life you are keeping: A big party of fishes and other aquatic lives means that you need an air pump that can comfortably cater for their oxygen needs. 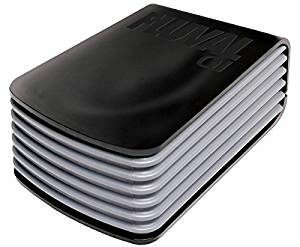 They are no hard and fast rule for choosing an air pump, once you consider the factors and needs, the next to shop for an air pump that meets it. Below is a review of some air pumps to make the decision easier. This air pump with 4 Outlets is super silent with multi-level muffler, low power consumption. Special artificial rubber to keep a steady air flow output and pressure that can be adjusted freely. Dimension: 6 x 4.1 x 9.4 inches. 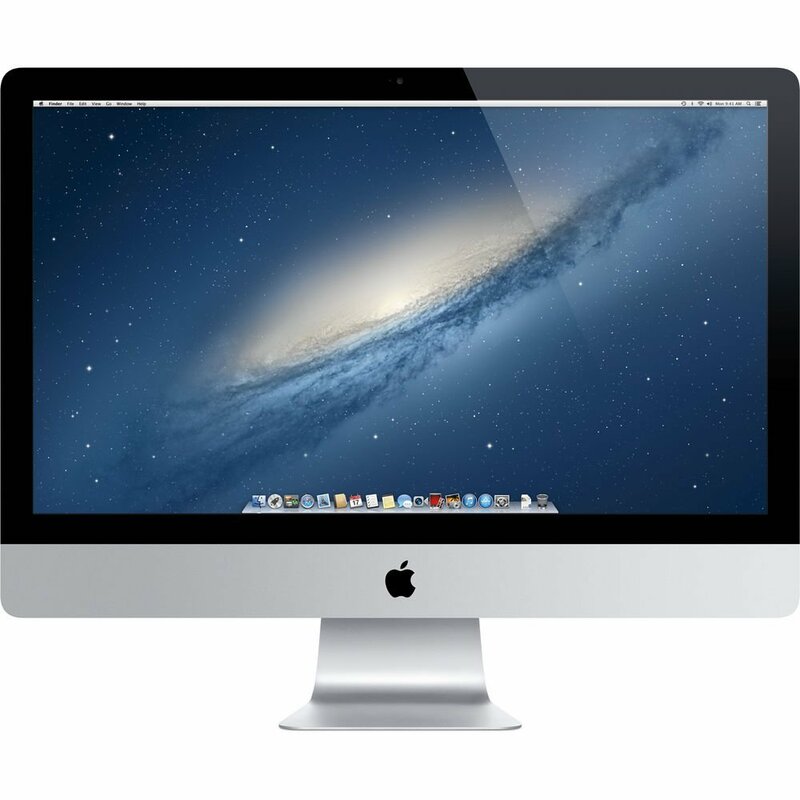 Most users complained that it is not as quiet as stated. Customers complained that after couple months of use the air pressure becomes weak. Not all the outlets seem to work. 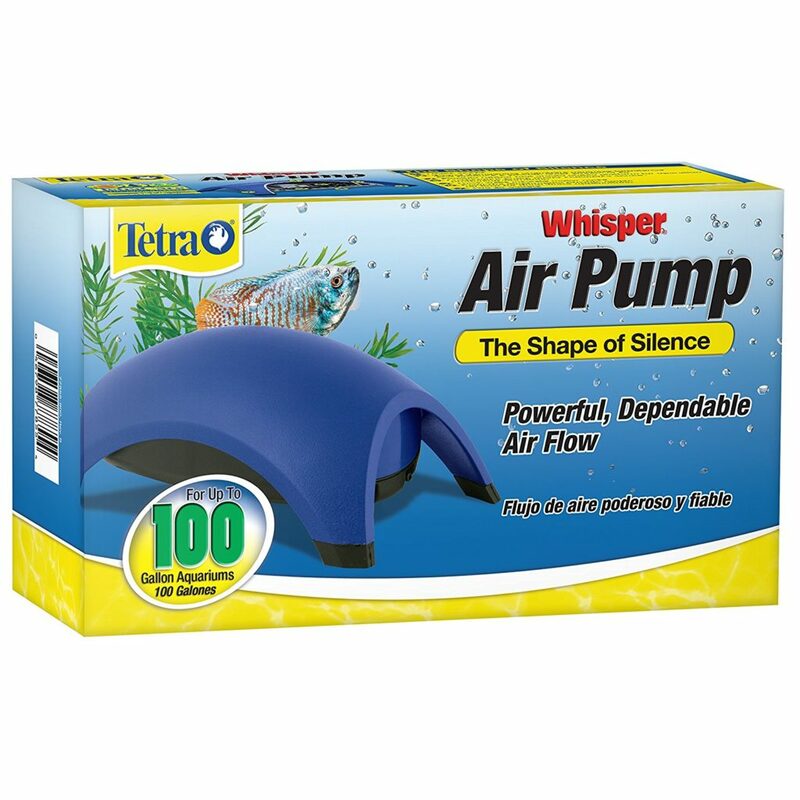 The Whisper 10 Aquarium pump has a unique dome shape and sound dampening chambers to minimize turbulence and produce a smooth, quiet stream of air. 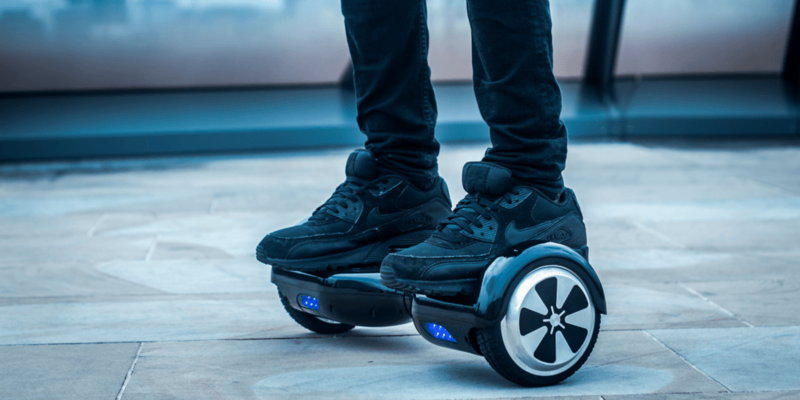 Its overall design works to eliminate sound producing vibrations. Dimension: 3.4 x 5 x 8.4 inches. Energy consumption stats: Not specified. Gallon capacity: Up to 100 gallons. Warranty: On request from customer service. It got one star rating mostly for the loud noise users say it produces. Some users also complained about low air pressure. 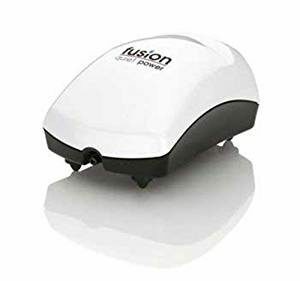 The Fusion Air Pump 200 has a Fusion plenum that absorbs sound and makes the Fusion Air Pumps extremely quiet. This unique plenum also regulates the air flow creating a constant powerful output. It also comes with an electronic air control knob that creates a quiet and precise air flow that can power up to 2 air devices. Dimension:8 x 3.2 x 2.2 inches. Noise prevention measure: Patented Fusion plenum system. Gallon capacity: Up to 20. Not as advertised, there is no quiet control knob. It starts producing noise after some space of use. The Fluval Q2 Air Pump is a powerful, yet extremely quiet air pump for aquariums between 50-160 gallons. The Q2 Pump produces a consistent air flow, thanks to the advanced swing arm and diaphragm design. The double walled construction, integrated pump well and engineered noise suppressing baffle chamber making it one of the quietest air pumps to date. You can also adjust the air flow. Dimension: 3.2 x 7.8 x 6.4 inches. 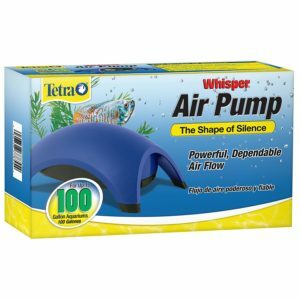 Tetra Whisper Air Pumps has a unique dome shape and rubber feet which flatten sound wave frequencies and helps prevent them from reflecting off of surfaces such as tables and shelves, allowing your pump to produce minimal noise. 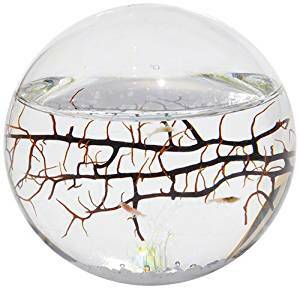 It can be used in deep tanks (up to 8 feet deep), and have enough strength to power long decorator air stones, multiple air stones in one or more tanks, and protein skimmers for salt water aquariums. Dimension: 3.2 x 7 x 4.8 inches. Gallon capacity: Up to 150. It gets noisy after a few months of use. Replacement parts are not covered under lifetime warranty. Some users complained about weak output. 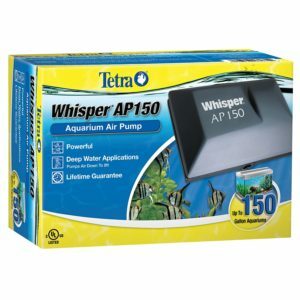 Air pumps are important for your aquarium, the functions and advantages have been treated in this article and a review of some selected pumps was made. All so you can make a better purchase decision. 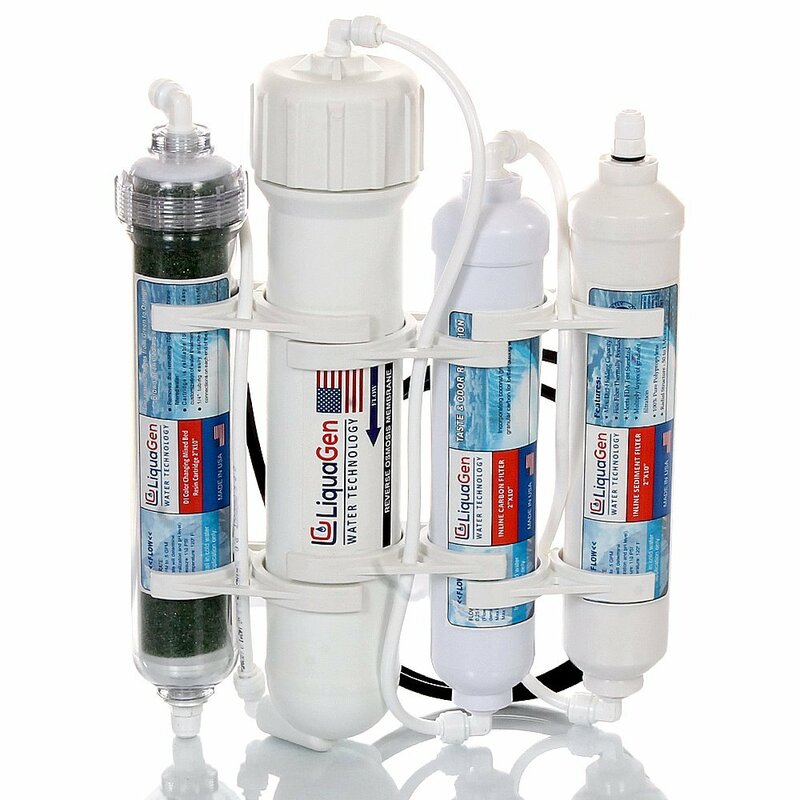 You can also learn more about reverse osmosis system for your aquarium tank here.